The latest Star Wars book is a young adult novel that covers a lot of the period between when we last saw Ahsoka Tano in Clone Wars and when she showed up in Rebels as “Fulcrum.” There’s a lot going on in the book, and it’s worth your time to read the whole thing. But as for the Star Wars universe as a whole, there are a few vital things to know. 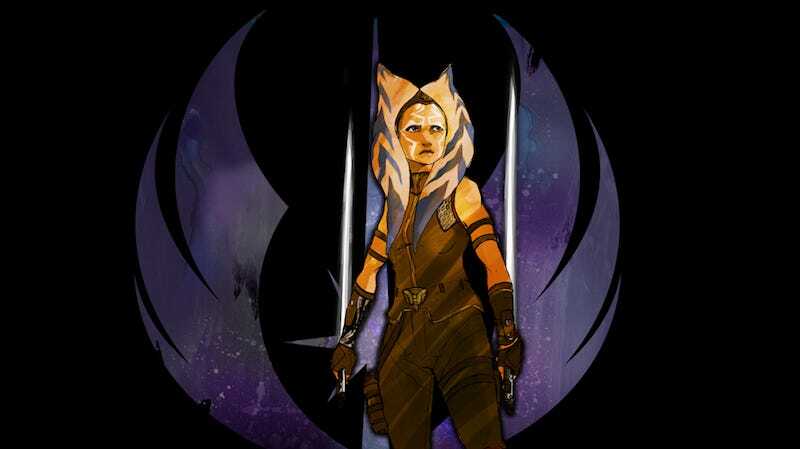 Although she doesn’t yet know what the Inquistors are called, Ahsoka does run into one of them in the book. This one is the Sixth Brother, and he has the spinning double-lightsaber trick and gray skin that is to be expected from them at this point. Ahsoka points out that the Inquisitors are only sort of trained in the Force. They’re mostly brute force-oriented, and anyone trained by actual Jedi would be more than a match for them. It turns out that the reason Ahsoka was able to unite the crew of the Ghost and the clone soldier Rex in Rebels is because she helped him hide. In a flashback in Ahsoka, it’s revealed that they faked his death at her hands. They even created a fake grave for the man and Ahsoka left her old lightsabers at the fake gravesite. The white lightsabers Ahsoka has in Rebels are built in this book. Ahsoka collects various parts over the course of her wanderings to make the casings. But she completes the lightsabers with parts from the spinning dual one that used to belong to the Sixth Brother. She takes the specialty parts and the kyber crystals from that in order to make her lightsaber. Ahsoka also says that the crystals feel familiar, saying that she thinks the crystals used by the Inquisitors were taken from the Jedi temple and infected with the Dark Side until they turned red, a.k.a. “making the crystal bleed.” She’s returned them to the light, which is why they’re white now. One of the features that the old Expanded Universe added to the Empire was its distaste for most women and nonhumans. Ahsoka starts to bring that back, when a bartender on a rim world (the Star Wars universe has a “Core,” which is important, populous, and cultured, and the “Outer Rim,” which is sparsely populated, often lawless, and a backwater. Think the difference between Coruscant and Tatooine) says that “There’s been a bunch of new people, coming out from the Core worlds. Nonhumans.” Seems like being closer to the Imperial seat of power is not great for other aliens. By the time of this book, the Wookiee homeworld of Kashyyyk has lost its fight against the Empire and the Wookiees have been enslaved to work in various mines and camps. It’s also the tipping point where most Stormtroopers are no longer clones, but regular recruits. Also, it’s revealed the Empire doesn’t just use fear to control people. Ahsoka notes that they are also a fan of using hunger to cow any potentially troublesome system. She also sees how the mechanisms she helped to put in place during the Clone Wars are being used by Palpatine to solidify the Empire’s power. In case anyone was wondering how it could be that the few active Force users in the post-Revenge of the Sith/pre-A New Hope era can’t feel each other, Ahsoka answers that question a little bit. Ahsoka meditates, but she says that the Force feels different after most of the Jedi were slaughtered. She can’t sense Anakin or any other Jedi. Even the general sense of Jedi being out in the world is missing. That’s the technique Obi-Wan’s spending his days perfecting, and now the little moment where Obi-Wan closes his eyes before being struck down by Vader makes a little more sense. Ahsoka sorts of stumbles into joining the Rebellion, as she’s such a good person at heart she can’t seem to avoid doing good deeds. For example, Ahsoka’s work rescuing Force-sensitive children is given an impetus in this book: there’s a girl who moves things with her mind that Ahsoka feels guilty for not protecting (there’s more to that story, but read the book). Her guilt over spending so much time running from the Empire and not serving others has Ahsoka begin to do some minor good deeds for people in need. One of the people whose attention she grabs this way is Leia’s adopted father, Bail Organa. Bail is in the midst of getting the Rebellion running, so he sends two of his associates to pick up Ahsoka; she outwits them, but Bail also sent R2-D2. Ahsoka recognizes him and ends up rendezvousing with Bail anyway. Also, as of right now, Artoo’s memory is not wiped. Not only does Bail get Ahsoka to start working with them, he also meets with her on the Tantive IV and with Captain Antilles—the unfortunate ship and captain that Darth Vader captures Leia on in A New Hope. Bail does some probing to make sure Ahsoka doesn’t know Leia’s true parentage or the existence of Luke. He’s satisfied that she doesn’t. Ahsoka’s experience inspires her to clean up the communications of the Rebellion. She asks to “take your recruits and find missions for them. I want to be the one who listens to what people need, who finds out what people can do and then helps them do it.” It’s right then that she comes up with the Fulcrum code name. While there’s no outright mention of the Death Star, there are a number of scenes that hint at things rumored to be connected to the Death Star’s construction. For example, the Empire is destroying a world in order to quickly grow a plant that “could be processed into a nutritional supplement that allowed people in low gravity to process oxygen more efficiently.” That feels like something they’d need for the workers floating outside a giant, half-built space station. Ahsoka also visits Ilum, the ice planet where Jedi younglings went to undergo the ritual that brought them to the kyber crystals needed for lightsabers. When she arrives, a couple of Star Destroyers and a large mining ship are in orbit around the planet. There’s been a persistent rumor that Rogue One will prove that a kyber crystal was used to make the Death Star’s planet-killing laser; this definitely seems to hint that the Empire has a more than passing interest in kyber crystals.